CrossFit training is unlike traditional workout regimens in that it is uses many different movements from lifting to sprinting to box jumps, deadlifts and the fun list goes on and on. With the recent surge in the popularity of CrossFit training, a new class of shoe has been developed. CrossFit footwear is not like your traditional shoe designs because CrossFit is different from your traditional methods of training. Adidas CrossFit shoes, manufactured in Germany, offer a wide variety of footwear options to suit the particular needs of this new class of athletes. Adidas is among the best in the business in CrossFit. How do I know that? Well for one, the company owns CrossFits top sponsor, Reebok. Even Mixed Martial Arts fighters Luke Rockhold and Robbie Lawler have put their trust in Adidas. CrossFit Adidas shoes provide the stability needed for lifting activities while enhancing the comfort and support required to help athletes endure the extended workouts of the day critical to training success. In order to ensure your feet can withstand the rigors of CrossFit demands, they must be minimal yet stable to ensure your feet are cared for in the long run. Adidas CrossFit shoes provide that critical balance to ensure your long-term success in the Box and provide the right support to prevent injury. Below, I have highlighted absolute best CrossFit Adidas shoes that you can buy to take your workouts to the next level. This shoe is designed for weightlifting performance. It incorporates a leather upper combined with a synthetic foundation. An instep strap provides comfort yet structural stability. The hook-and-loop strap and textile lining provide an adjustable fit offering the right balance of snug closure and flexibility of movement. The power strap and mesh tongue ensure performance under heavy loads. Its lightweight design and breathable vent holes ensure a design that gets you through the most intense WOD’s. This shoe is geared towards the unique requirements of the female athlete. Unlike the Adipower model above, the Adipure is composed of a synthetic textile material ensuring breathability and flexibility for your most vigorous workout sessions. It is also ideal for other activities from aerobics to dance class. The rubber sole provides the traction necessary for sprinting while still providing support for intense weight training. This combination ensures ease of movement and ankle support. The Powerlift 2 men’s shoe, is similar in material to the Adipure women’s model in that it incorporates a synthetic textile construction while providing support by means of a high-density midsole. Adidas’s distinctive three stripe design is complimented by numerous colors and styles to suit your distinctive style, from solid to multicolor variations. The lightweight, yet high density flat profile sole is focused on the particular needs unique to weightlifting exercises. It is ultimately not ideal for running activities. Keep in mind that where this shoe does excel in weightlifting, its weakness lies in it's versatility to handle a whole CrossFit WOD which has lots of running and sprints. Th﻿e ﻿Pure Boost ZG﻿ T﻿raine﻿r, geared towards men, is a more economical choice than the models above. Best suited for multi-skill training programs, this style is geared towards all intensity levels and a broad range of exercises. The Pure Boost ZG Trainer transitions well from gym training to outdoor competitions to provide all-around performance. It utilizes a synthetic upper material for lightweight comfort and breathability. The rubber, non-marking sole provides superior grip in a lightweight and durable construction. The Adidas ZG Bounce men’s shoe is an economical choice within the offerings of CrossFit Adidas shoes. These are geared towards the intermediate cross training athlete. The rubber sole provides the grip necessary for quick lateral movements while the synthetic upper ensures breathability and comfort during your longest WOD’s. A web corner in the heel is ideal for securing your foot in a variety or terrains. The Bounce feature enables superior cushion and an energy returning spring to protect your joints during vigorous cardio sessions. As you can see, there are a number of CrossFit shoes by Adidas available in a wide array of styles, price points and specialized roles to ensure your shoe choice is fit for purpose. The unique challenges posed by cross training exercises require a shoe that provides correct form of movement. In case you're wondering what our personal favorite of the bunch is, look no further than the Adidas Performance Adipower Weightlifting Trainer. We loved the performance of these shoes on the lifting components. But ultimately, you must weigh the pros and cons of the shoes you are looking for. Simply put, Adidas has some of the best cross-training shoes on the market. This has prompted Adidas to offer a variety of choices to the consumer. Of the five models I have highlighted above, there is sure to be a style that suits your particular workout needs and price point. 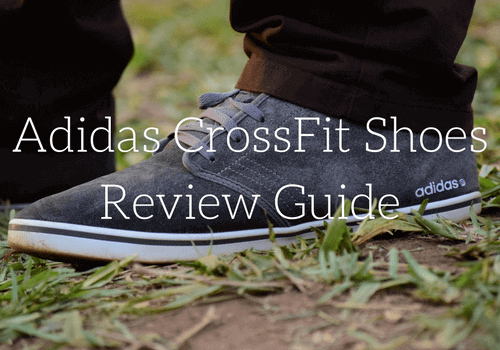 Want to see an in depth guide with the absolute latest and greatest CrossFit shoes around? We have created a simple review of the Top 10 CrossFit Shoes you can purchase and summarized all the Pros/Cons of each.